This board is intended to be used by customers to implement and design 10G Ethernet systems based on transceiver host boards that support XAUI interfaces. This mezzanine card is intended to be part of an openly sold Development Kit and can be bundled with packages of Software and IP Cores. It will have 2 full duplex 10G SFP+ channels with a XAUI backend interface. 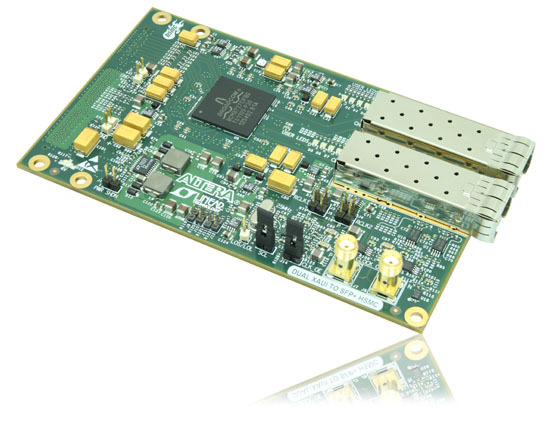 The XAUI to SFP+ HSMC provides a hardware platform for developing embedded systems based on XAUI based Altera “GX” based devices. The devices that presently support XAUI are Arria GX, Arria II GX, Stratix II GX and Stratix IV GX.